Cathy’s friend had tried to set her up with Alan four times before she finally agreed to meet him for beer and chicken wings. An avid golfer and a fan of wearing very bright colours, Alan met her in his bright Hawaiian shirt, canary-yellow pants and red running shoes. During their date, Cathy was very sick. Alan called her repeatedly the next day to make sure she was ok. They’ve been together ever since. Over twenty years later, Alan and Cathy first heard the word “aneurysm” when it burst in Alan’s abdomen. Found early, recovery was quick and within six weeks, he was back up and running. In February, Cathy was awake early-- her friend’s husband had passed away and both Alan and Cathy had been busy the night before. She didn’t think it was strange at all that Alan would still be sleeping at 9am. But at 11am, when Cathy checked in on Alan a second time, she noticed he had been sick. She realized he couldn’t sit up or even move. Alan’s brain was bleeding, and doctors stopped the bleeding by clipping the aneurysm in his brain. A weakened blood vessel had ruptured and bled into his brain, causing a stroke. During an aneurysm, the blood accumulates and compresses the brain tissue, leading to weakness or paralysis, trouble speaking, understanding language, vision problems, or seizures. Once an aneurysm bleeds, the chance of death is 30 to 40 percent and the chance of moderate to severe brain damage is 20 to 35 percent, even if the aneurysm is treated. Alan also suffered through two seizures within days of each other, and continues medication to help control this dangerous side effect. “After the surgery, he had a tube coming out of his head, he was on a respirator and a feeding tube,” recalls Cathy. “I could see it was so painful for him.” Affected by the stroke, Alan couldn’t speak, and he lost all movement on the right side of his body. 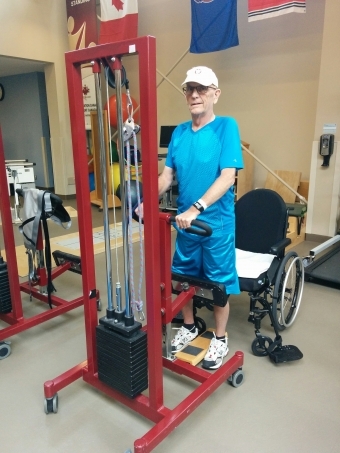 After two months in hospitals, Alan was transferred to Hotel Dieu Shaver Health and Rehabilitation Centre. Cathy is up at 3:30am every day. She starts the day taking care of their rescue dog, a shih tzu named Zoe. She tidies up the house, then she’s on her way to meet Alan for his morning therapy session. She stays most of the day, learning the exercises for when Alan returns home, and visiting with friends and family that stop by. She helps Alan get settled in at night before returning home. “My days are busy and full, and sometimes it can be hard to sleep with everything going on.” But she says it’s important to stay positive. “The mind is so powerful. You have a choice to get depressed, or you can see it as a little hill you have to climb. And you just do it, fly with it. Plus, I’m stubborn,” she says laughing. Because Alan was mixing up some words and names, a common side effect among stroke patients, his sister wrote “Cathy-wife” on his left leg, just above the knee to help him remember. The faded pen markings are still there today, as Alan points to the words while practicing standing on his own, wearing his trademark bright blue matching shirt and shorts. Alan is recovering well. He has a wheelchair, which he can get in and out of on his own. He is writing again, and continues therapy for his right hand. His right leg has been fitted with a brace to help him walk. The couple met with the SOS-Survivors of Stroke group, a support group for stroke survivors, their family and caregivers. The group gives the opportunity for patients and their caregivers to discuss everyday issues and experiences, and to share stories about their journeys. Many of their friends have also been supportive. A friend brought Alan a golf club and golf ball, which he has held on to while in the hospital, giving him hope to be able to play again one day.